We had a bad hail storm a week and a half ago. Very large hail for over 30 minutes straight. It totaled my 2017 Mustang, my wife's floral shop delivery van, and my son's 2018 Focus. It also totaled our roof. Half of it is tarped up right now. Our screens are all shredded, but at least no windows were broken. Lots of other damage as well but I won't go into that much detail. Now I'm on the hunt for a new car. Hadn't really planned to get a new one for awhile, but I guess plans change. Looking at some new and used Mustang GTs now. Hey, at least I have a fun rental car! A 2019 Camaro SS. Yeah, I know, but it IS A FUN CAR! Time for a 2019 BULLITT! On a serious note, sorry to hear. I found a brand new 2019 Mustang GT (black of course!) with the 10 speed automatic in southern Texas for under $30,000. I'm probably going to buy it! Figuring out the logistics and finances now. FarmerDon, bullit4404 and PhillyBULLITT like this. I rented a 2017 Camaro SS last year for the Woodward Dream Cruise. It was supposed to be a Charger R/T to better fit my 6'6' cousin but it was a Camaro SS when we got to rental car counter. Within 5 minutes I knew I'd never want to own one. Terrible interior, terrible seating position and visibility. Mashing the throttle, steering and brakes was fun I'd have to admit. Hope the hail damage has a happy ending for you. You're right on the visibility! I'm sure your cousin fit pretty tight in there. I'm only 5'10" so it's no problem for me to get in it. Mashing the throttle... that's the fun part! Oh, by the way, my 2001 Bullitt was safely inside during the storm! TwoStangWmn, Tony Alonso, DavidMidgley and 4 others like this. make sure that south texas car is not a flood damage unit. Hail can be some rough stuff. I guess if you have the 01 in the garage, it was a no sale when you advertised it. I'm very sorry to hear about you damage. I hope you had insurance!!! David, I never actually ended up advertising it. It would be hard to let it go. We are coming out pretty good with our insurance. All things considered, it is minimal out of pocket. More of a headache and inconvenience. They sold that Mustang GT out from under me before I got the loan. I actually even submitted the loan app through them and everything. I wasn't happy, but maybe it was meant to be. 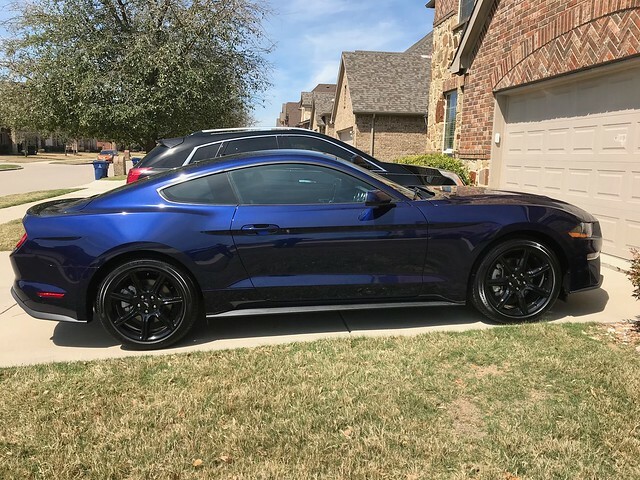 I ended up buying another new Ecoboost Mustang. It is Kona Blue with black accent package and 10 speed automatic. Very nice looking car. I'm not loving it yet though. Maybe because I drove that Camaro SS for a week and a half??? Mostly, I feel like the seat in the new Mustang is very uncomfortable and I just can't seem to get it adjusted right for me, plus it seems very hard. Hopefully over time I will get it adjusted and it will break in and become more comfortable. My 2017 had power seats and had a lot better adjustability than this new one that has manual seats. As for driving it, it is very underwhelming compared to the Camaro SS. Not much of a surprise after losing 150 hp. DavidMidgley, Marguerite and bullit4404 like this. Here is the new car. Sort of reminiscent of my Bullitt? Tony Alonso, DavidMidgley, Palerider and 2 others like this. Love the blue color!!!! Very nice!! !